Raisin Cake. 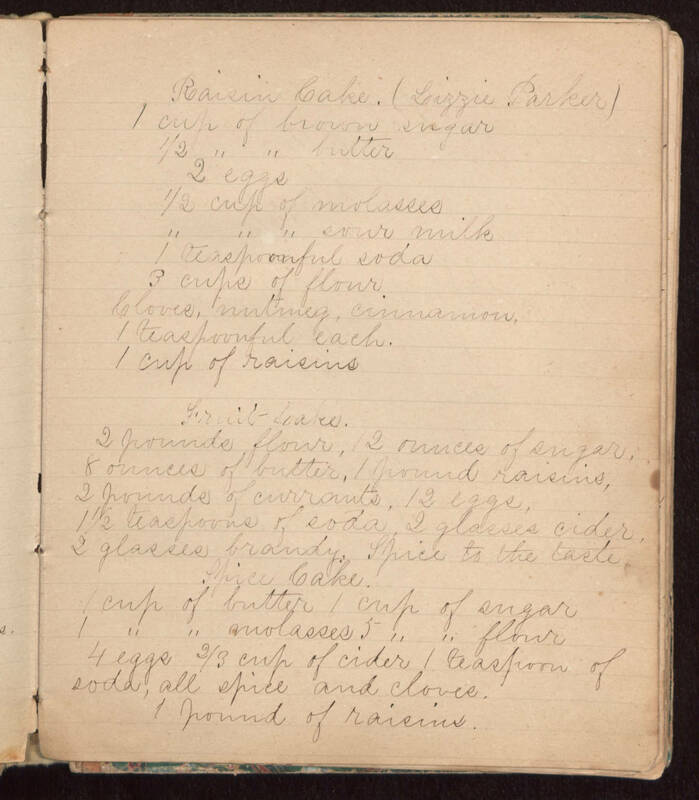 (Lizzie Parker) 1 cup of brown sugar 1/2 " " butter 2 eggs 1/2 cup of molasses " " " sour milk 1 teaspoonful soda 3 cups of flour Cloves, nutmeg, cinnamon, 1 teaspoonful each. 1 cup of raisins Fruit Cake. 2 pounds flour, 12 ounces of sugar, 8 ounces of butter, 1 pound raisins, 2 pounds of currants, 12 eggs, 1 1/2 teaspoons of soda, 2 glasses cider, 2 glasses brandy. Spice to the taste Spice Cake. 1 cup of butter 1 cup of sugar 1 " " molasses 5 " " flour 4 eggs 2/3 cup of cider 1 teaspoon of soda, all spice and cloves. 1 pound of raisins.